The practice of moving stained glass windows is as old as the medium itself. Even when set in stone, stained glass has still found reasons to relocate, sometimes to a different window in the same cathedral or maybe to a different county. Changing tastes were the most frequent cause in the past but today the reasons are demographic in nature. If the plans for your Church’s project include stained glass, you may already be venturing into the marketplace. In the following essay, I have distilled thirty years of the experience hopefully to benefit your project and some stained glass windows along the way. Adaptive reuse is not a chance to get stained glass “on the cheap” but rather an opportunity to enjoy a level of artistic excellence beyond what a congregation could otherwise afford. The vast majority of stained glass in America was made between 1890 and 1960. Much of what was made domestically was the work of small studios scattered throughout the U.S., creating windows from pattern catalogues. Such windows often feature painted symbols in circular medallions. The very best art windows from American studios include the works of Louis Tiffany, John LaFarge and others, who developed new glass technologies and a new style of window making. Still other American artists looked to a medieval model for inspiration. All the while, studios in England and Germany were sending their best efforts to America. Today the market place for historic church windows runs from the suburbs of the east, down through the south and southwest and all the way up the west coast. New congregations that are building as well as older churches that want to renovate are still desirous of stained glass and the traditional has made quite a comeback. It is not unusual these days for Churches to ask for windows by a specific Bavarian studio. Perhaps you have heard it said “they don’t make them like that anymore.” Most cannot, but the Beyer Studio creates windows of that quality every day. Our website is full of new windows that cannot be distinguished from the best turn-of-the-20th Century works. Unfortunately, not every church can afford to commission new windows at a cost above $700 per square. The best century-old windows purchased through the Sacred Window Rescue Project sell for $200 per square foot; but purchasing a window is just the beginning of a process. The antique windows you purchase will certainly require restoration and, oftentimes, a complete rebuilding. There may be design and engineering fees. If your project is still in the planning stages, you may need to store them for several years. So the real price of reusing old windows includes all of the costs between removing them from their original setting and seeing them safely in a new location. To know what those costs will be, you will need the services of a qualified stained glass studio, and preferably one that can demonstrate a history of successful adaptive reuse projects with references. You should not undertake to purchase windows without knowing, within reason, the full cost of seeing the window project completed. If you can view the old windows while they are still in their original setting, all the better, and by all means, take your professional stained glass artist along. If you have an architect, you should not leave them in the dark about your plans. Your architect and professional stained glass artist, working in concert, will not only be able to give you the full cost implications but also provide the expertise to realize the project. Even in cases where comprehensive restoration and complex adaptation are required, the reuse of antique windows will probably still be achieved at a cost below that of commissioning new windows of the same quality. It would be possible to buy new stained glass windows for a lower cost, but they would not be of a quality equal to the best works of the early 20th Century. So, it makes economic sense to recover these windows! True enough, but much more is also true. These works of art are part of our cultural heritage and well worth preserving. In Europe, the state provides funds to subsidize preservation; but in America, we must assume the responsibilities that come with so much opportunity. We simply cannot abandon these windows to an uncertain fate. The Sacred Window Rescue Project (sacredwindowrescueproject.org), our growing and freely accessible listing of over 600 windows available for purchase from their owners, without fee or commission, is a great place to start. I also recommend contacting the diocese, synods and presbytery in cities that have lost population in the past few decades. These are the organizations most likely to have a surplus of buildings and stained glass. I have personally networked this way, trying to fill a particular need. This is best done by phone and/or e-mail. Begin by contacting the real estate office of an organization. Their website might list an office of closure for disposing of sacred objects and works of art. If you do not find such an office listed, ask if one exists. The Internet is a great tool but you should endeavor to view any prospective windows in-person. Avoid selecting windows based solely on how they appear on-line. I don’t recommend e-bay nor do I believe the antiques market is a good place to search. Be careful when dealing with websites that buy and sell windows for profit. Such sites are a mixed bag and you have little means of discerning the forthright from the shady on-line. We have seen photographs of windows offered for sale on-line that were taken directly off the Sacred Window Rescue Project website for the purpose of “bait and switch” tactics. It is far better to search among the non-profits that have a surplus of windows. While these organizations would prefer to make a profit, their sense of responsibility to the windows yields an added incentive to find good homes for the works of art in their care. Many such organizations have a degree of respect and appreciation for religious art that disallows the casual disposal to the highest bidder. Many will constrain the sale of windows by proscribing that the new owners must be a church of the same denomination. The rules of sale vary among organizations, but those that have rules, have them to ensure that the works of art are treated with respect. Common values between buyer and seller makes negotiations toward a common goal that much easier. Be patient and look far and wide. Enlist the help of others on the committee and divide the labor of contact and follow-up among a small group. Believe it or not, there are a lot of windows available, so don’t be in a hurry to buy the first thing you see. It is important to recognize that being inexperienced in stained glass matters means that you are ill-equipped to judge the value of a “deal” because you can’t know the true cost of reusing what is on offer. So do not allow yourself to be stampeded into agreeing to a sale before you have the professional advice you need. If the windows are 100 years old, they will still be there next week. All old windows do not share the same condition. Stained glass windows consist of multiple pieces of glass supported by a matrix of extruded lead channel called cames. Over time, this matrix will begin to weaken and eventually all windows will need to be rebuilt. Rebuilt means taken apart piece-by-piece and reassembled with new leading. Do all old windows require this? No, it is not automatic that windows need to be rebuilt and there is no firm rule about this. The age of the windows, the types of lead a window was assembled with and the engineering in a window’s design all factor into how well the matrix of lead survives. German and English windows generally survive well. American windows from larger studios were also made to professional standards. Often, however, windows that appear sound while in-place begin falling apart during removal. A window’s age can offer an indication of the lifespan remaining in a matrix of lead. Once a window reaches 80+ years, the benefits of rebuilding should be carefully considered. While it may be possible to relocate a window leaving the original matrix intact, to do so may not make economic sense if, within the next 20 years, the church will be saddled with an expensive restoration project. If it can be afforded, it would be better to rebuild the windows while they are in transition and available to be worked-on. Perhaps your church has only the funds to accomplish the transition and not the comprehensive restoration. If so, then proceed with the knowledge that a restoration project will eventually be required. 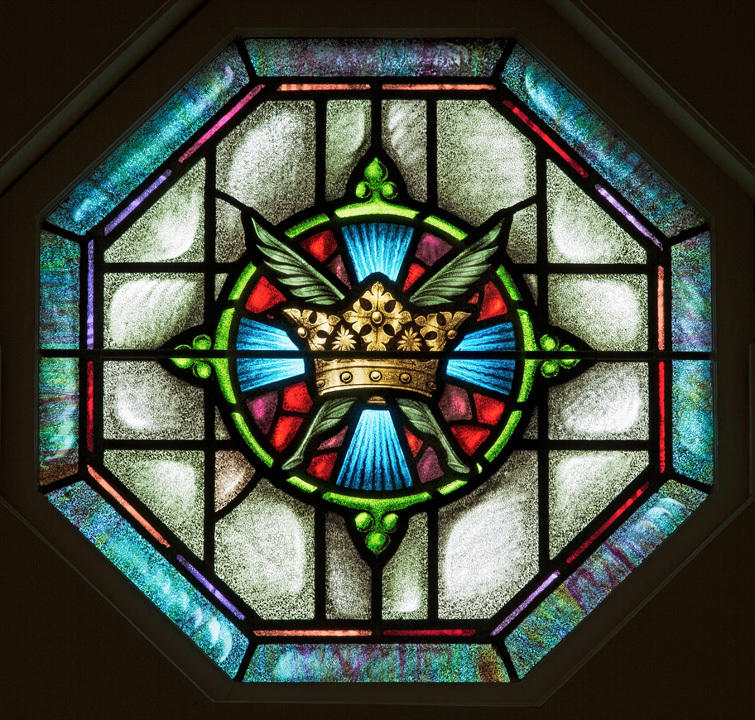 Even if the windows you have chosen do not need to be rebuilt, there are a number of remedial procedures and upgrades that must be accomplished in order to relocate any stained glass. Years of exposure to the oils in putty leave the perimeter leading around each section badly oxidized and easily damaged during removal. This powdery oxidation is toxic and friable. The removal crew will be wearing protective clothing, respirators and surgical gloves for protection and, before this window can begin a new life, the perimeter leading must be removed and replaced with new lead. Usually a contemporary window setting will include a contemporary aluminum frame. All windows need steel reinforcing but the re-bars that secured the sections in their previous setting will not work with a contemporary frame. So the reinforcing bars must also be changed. Finding Stained Glass for an Existing Building. Perhaps your parish church was built in the 1960’s with a budget that only allowed broad panes of colored glass set in drafty inefficient frames. Or maybe you are planning to convert a room in the rectory into a Daily Mass Chapel. These are two of the most frequent types of projects that visit the Sacred Window Rescue Project site. While a retrofit is oftentimes a more modest project, it is usually more challenging for two reasons. First, one needs luck in finding the correct number of windows that feature the desired subject matter or at least something similar to what you had in mind. The biggest hurdle, however, will be finding windows of a size that will fit your existing window openings. It is a fact that older churches had big windows and many windows from the grander turn-of-the-century Gothic or Romanesque buildings will simply be too large and too tall. This is a problem for Churches built through the post-war years with low wall heights down the aisles. Size is the most important factor in a retrofit. The closer the match between the dimensions of your window openings and the prospective stained glass, the better looking and less costly the relocation will be. It is easier to make a smaller window a little larger than to make a larger window fit in an opening that is too small. Attempting such a force-fit may require cutting away important elements in the composition that will forever compromise the artistic integrity of the work of art you were hoping to preserve. Truncating a gothic peak to fit a rectangular window opening will probably look crude and visually unsatisfying, no matter how beautiful the scene or saint that remains. Pay close attention to the architecture of your building. If it is modern in character, you may want to look for windows that will fit comfortably in that idiom. There are windows available from modern churches that will better suite a building of the same period. Keep in mind that the stained glass will be seen from the outside too. Even if you are not a fan of modern architecture, it is nevertheless a fact that you cannot change architecture by decorating. “Church” should mean harmony. Accept and work with what you have and avoid forcing disparate styles to coexist. Works of art need to be team players for the greater goal. I have seen examples where gothic windows seemed quite at-home, for example Saint Mark Catholic Church in San Antonio. Here architect Greg Davis made certain that there were supporting details throughout the project that, together with the stained glass, yielded a cohesive, integrated whole. A completely different strategy with an equally satisfying effect was achieved when Saint Cyril of Jerusalem in historic Bucks County, Pennsylvania, added several modestly-sized Bavarian windows to the plans for a welcoming space in their new church, in a manner not unlike a museum display. For the intimate Daily-Mass conversions, we often look for windows from a convent chapel or maybe a sacristy. Windows coming from smaller spaces are more likely to be good candidates for this size project. I highly recommend making use of a professional liturgical designer. There are designers who have made it their business to know and understand how a worship space should look and feel. You probably employ the services of an accountant to do your taxes, knowing that their expertise will pay for itself many times over. It is no different with design. The benefits are always obvious. Their knowledge and experience will help you avoid problems by giving you a preview of how it will all come together before you begin. So the key to success with relocating stained glass into an existing building is finding windows that represent the optimum match of size, style and subject matter. The larger the pool of prospective windows, the greater your chances of finding the perfect fit. I mentioned that buying old windows is not a way to get stained glass on the cheap. Your window frames are one reason for this. If your church building is 40-years old or more, it most likely features aluminum window frames with only a single pane of glass. Such systems were engineered at a time when heating oil was a nickel a gallon. It is also possible that your buildings windows are made of wood or even steel. If they are handsome or historic, you may want to preserve and restore them as well, to maintain the character of your architecture. So by all means, consult your design professional about frame restoration. If your window frames fall into the category of unremarkable and inefficient, it would make little sense to invest in art and install it into obsolete window frames at the end of their useful lifespan. So unfortunately, the goal of realizing stained glass in your building may include upgrading your window frames. Your plan was to bring beauty into the worship space has grown to include a major improvement to the building envelope, nearly doubling the overall cost of the project. Your new frames will include a separate layer of glazing on the exterior. Usually this will be a one-inch thick insulated glass unit consisting of two panes of glass sealed with a space between. The stained glass would be set into a separate glazing track on the interior. Such frames come in a variety of standard finishes. Custom colors are more expensive. While it is possible to employ storefront type commercial frames and add extra moldings onto the frames to hold the stained glass, this is a less satisfactory method. While this may initially seem a thrifty strategy, the labor required to add the extra moldings to hold the stained glass will consume any savings. Even more important, adding the extra moldings makes the divisions between the sections that make up a stained glass window quite thick, visually disrupting the composition. It has been my experience that storefront-type frames turn out to be just as expensive and often cause the stained glass to look bad in the bargain. There are companies that make window frames of aluminum specifically engineered to hold stained glass and I strongly recommend this option. J. Sussman Incorporated in Jamaica New York is one such company, but there are several others throughout the country. Who will do all this work? What type of contractor(s) will you need? To be sure, you will need the services of a stained glass studio. Even if you have found windows that are very close to the size and shape of your existing window openings, there will still be a minimum of labor required to adapt the windows for a new setting. You will also need a contractor with experience in the installation of windows. This could be the stained glass studio but if they do not possess this experience, then you will need to hire a glazing contractor. I would hire a local glazing contractor but insist on the specification of stained glass-type frames. I would only allow the substitution of their common store-front framing system if they can demonstrate that the engineering of their product will not result in sight-lines that are visually disruptive to the stained glass. This is where you should rely on the stained glass studio to advocate for the windows and review all engineering drawings for new window frames. Be sure to include coordination with and review of the glazing contractor’s engineering in the stained glass studio’s scope of work. If your project is located in an institutional-type building, such as a school, you will most likely need new frames here too. If you are adding stained glass to a rectory or any residential-type building with double-hung sash windows, then there may be more options available. There are old stained glass windows from closed rectories and convents in this same format that are available for relocation. It is possible to install stained glass in movable sash windows. The pane of clear glass is removed and the section of stained glass set directly into the sash. This will work for windows up until the 1970’s when residential windows became standardized and pre-made. Contemporary pre-fab residential windows like Pella or Anderson, will not easily accept the addition of stained glass. I have seen successful projects where the sashes were removed and the outer wood frame adapted to hold stained glass, with a layer of storm glazing installed over the exterior. For this, an experienced carpenter, working closely with the stained glass craftsman, will be a good team. 1)	Full-spectrum lighting. this is essential to show all the colors without blank spots in the range of visible light. We prefer simple florescent fixtures because they are readily available, now and in the future. Avoid high-tech, such as LED lighting. 2)	There must be a diffusing screen between the light bulbs and the stained glass. A sheet of white translucent Plexiglas will actually luminesce to become a source of evenly distributed light behind the entire stained glass window. 3)	There must be a means of access for changing light bulbs built into the box. Finding Stained Glass for a New Church Building. All of the dos and don’ts above are just as relevant for a new construction project, but your search can encompass many more candidates without the constraints of matching a specific height and width. Still, you should keep in mind that old churches had high ceilings and buying very tall windows will commit you to a very high ceiling with a corresponding construction cost per square foot. If you are seeking a quantity of windows for a symmetrical arrangement, resist the temptation of buying individual windows that strike your fancy. Chances are you will not be able to find mates for this one-of-a-kind. Here again is something relevant for both new construction as well as retrofits. Many, if not most, old windows have dedication inscriptions. We have all read the text “to the Glory of God and in Loving Memory of” in stained glass windows. It is not uncommon for these to be in a language other than English, such as Polish, German or Lithuanian since many surplus windows originate from nationality-based parishes. Many inscriptions were also written in Latin. Dedication inscriptions are usually located in the ventilator sections at the very base of a window. Seeing these memorials, I am always reminded of the passage of time and generations. Will these dedications be left in-place and remain part of the window in the new setting or will they be replaced with new dedications? I have seen this handled both ways and each church must consider their options. These memorials were a means to raise funds for the stained glass, which is the perfect segue into my next topic. Somehow, you will have to raise funds to make all of this possible. The good news is that raising money for the stained glass that everyone loves is not difficult. In fact, it often subsidizes other parts of the project. New or additional dedications can be an effective way of funding the stained glass. Offering the opportunity to donate to a specific part of the church project moves the budget for art outside the general building fund, where it may fall prey to the dreaded “value engineering.” Pastors and Committees are often surprised at how much money can be raised simply by inviting parishioners to dedicate a window. It is normal for families to request a dedication that acknowledges living members as well as the departed. We have published some guidelines to help families compose a concise and meaningful passage. Have your glass artist offer design options for where the dedications should be located and how they should appear. Of course, any addition to a window should be accomplished without altering the appearance or detracting from the window in any way. A new dedication should be a permanent addition, rendered in vitreous glass paints and stains. The lettering of the inscription should reflect the style of the original window. Before you can solicit funds, you must first introduce the plan for stained glass to the parish. There is simply no equal to excellent photography for allowing the parish to appreciate what the new windows will add to the worship environment. Your artist should be capable of photographing the windows with professional equipment, hopefully while still in their original setting. After removal from their original setting, it is nearly impossible to get professional level images. They should also be ready to produce handsome display boards that will celebrate the acquisition of stained glass and announce any dedication opportunities. With the aid of CAD software, your architect can digitally incorporate the photographic images of the windows into their plans, allowing everyone to see how the windows will appear when the project is completed. Share all you can learn about the studio that made the original windows and the materials and techniques used in their fabrication. Take your most loyal donors to the studio hired for your project to witness the work being done to restore and adapt the windows. These promotional efforts will go a long way toward building the enthusiasm and support required to get the project to the finish line. Of course, an article such as this can only touch upon the many possible issues that can arise with such a complex undertaking. If you have questions about relocating old windows, you are welcome to call me at my Philadelphia studio (215-848-3502) during business hours eastern time or you can post questions on my blog’s forum at Joseph K. Beyer’s Stained Glass Blog or at beyerstudio.com.